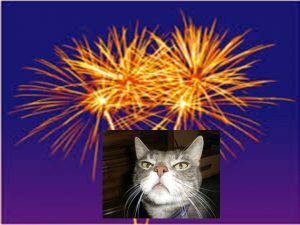 Lost Cat Tip – In a 2009 preliminary study of cats specifically panicked by fireworks, 90% of the cats were located within a 1 block radius of their homes (most were hiding on neighbor’s property). In the 2017 Missing Cat Study (posted on MARN’s web site), of the 1,200 missing cats that were lost and then found, the majority were found within a 1-block radius of their home. Unlike dogs (that run due to fireworks) cats don’t “run away” – they bolt (a short distance) and HIDE! Lost cats are territorial and their instinct is to hide in silence when panicked. When “displaced” from their territory (which happens when they bolt and hide in a yard they have never been in before) they become disoriented and while some of them DO overcome their fear and work their way home (sometimes after a few days) many of them DO NOT come out of hiding and they need to be SEARCHED FOR, especially in this heat! Putting a litter box on your porch IS NOT THE ANSWER to getting your lost cat back home–but conducting a slow, methodical physical search of your neighbor’s yards IS! The Missing Cat Study showed that overwhelmingly the primary method that brought the missing cats home in the study was “a physical search of my property or my neighbor’s property”. Simply asking your neighbor if THEY will look for your lost cat is NOT enough…your neighbor is not going to get on their belly and look under their deck or under their house, but THAT is where your lost cat is most likely to be and it is up to YOU to find your cat. Don’t let your fear of what your neighbor will think or say if you ask to search their yard…your cat’s LIFE MAY DEPEND ON YOU!! For more info on lost cat behavior, visit the Missing Animal Response Network page on lost cat behaviors. You will also find other information about lost cats and lost dogs on this site. PLEASE SHARE…YOUR CAT OWNER FRIENDS MAY NEED TO HEAR THIS!